Summary: June 6 morning, Shandong Nanshan Zhongmei E-commerce Company E-commerce Practice Training Class Opening Ceremony was held in Shandong Coal Group e-commerce industry park, more than a dozen electric business professional interns from Yantai Nanshan College in the professional led by the teacher to visit China Transport Group for training and learning, Deputy General Manager of China Transport Group Li Zhenbo, General Manager of E-commerce Company of China Transport Group Yanting,Vice President of E-commerce Company Yu Cui, Zhang Zhenuo, Lu Shuli and other leadership accompanied the visiting and attended the opening ceremony. Under the leading of Deputy General Managerr Li, the visiting panled visited the new office building of China Transport Group and E-Commerce Companies, Cross-Border E-Commerce Company, Network Information Company, Software Technology Company, Weixin Agricultural Technology Company, Kate Intelligent Robot Company, Intelligent Terminal Equipment Exhibition Hall, watched live demonstration of high-tech unmanned aerial vehicles and intelligent robot which independent research and development by Shandong Kate Intelligent Robot Co., Ltd, branch of China Transport Group. During the visit, Deputy General Manager Li made detailed introduction of total development of China Transport Group in e-commerce, cross-border e-commerce, new industry, e-commerce personnel training and other fields to the students and teachers, and received praise! by the students and teachers. Subsequently, in the Group conference room on the second floor, e-commerce practice training class opening ceremony of Shandong Nanshan Zhongmei E-commerce Company was held. At the ceremony, Deputy General Manage Li firstly expressed warmly welcome to the students and teacherson behalf of China Transport Group, Deputy General Manage Li said, Shandong Nanshan Zhongmei E-Commerce Co., Ltd. is jointly invested by the China Transport Group and Yantai Nanshan Group, the two sides adhere to the principle of mutual benefit, resources sharing to achieve the powerful combination of Nanshan Group's industry, product advantages and China Transport Group's power resources, to create an internationally renowned brand of e-commerce! China Transport Group, as the largest and most powerful industrial enterprise in Shandong Province, is experienced in the training of enterprise e-commerce personnel. According to the development plan and arrangement of Shandong Nanshan Zhongmei E-Commerce Co., Ltd., Our Group has sent promotion team elites that led by the Deputy General Manager Fan Peigong for three times to Shandong Nanshan Zhongmei E-commerce Company, to carry out team and skills training for the recruited staffs, and achieved good training results, hope to use, mastery, consolidate knowledge and practical operation during practice training at Our Group, and communicate with our e-commerce elites, as soon as possible to get familiar with the specific business process of e-commerce, prepare for working at Shandong Nanshan Zhongmei E-commerce Company in the future. It is known that the Yantai Nanshan College teachers and students will be accept a two-week e-commerce training at Shandong Coal Group, during which professional e-commerce elites will personally guide the new students on the machine operation, Group business embedded in daily teaching for new students, so to make everyone get contact with the actual business, to break the status of college students getting acknowledges from books without practicing so that every new student can enhance practical ability at the same time, also better adapt to environment and culture of e-commerce company! Shandong Nanshan Zhongmei E-Commerce Co. is jointly set up by Yantai Nanshan Group and Shandong Zhongmei Group. Yantai Nanshan Group, as the top 500 enterprise in China, has a strong industrial base, China Transport Group as the MIIT E-Commerce Innovation Enterprise, Shandong E-Commerce leading enterprise, has rich experience in the e-commerce platform construction and operation. The two sides will work together through the Shandong Nanshan Zhongmei E-commerce Co., Ltd., to build a global diversified, comprehensive product sales e-commerce service platform, to play a mutually beneficial role in their respective areas, through complementary advantages, resource sharing, strong combination, to better achieve the win-win situation for both enterprises, make a positive contribution for the rapid development of e-commerce ! June 6 morning, Shandong Nanshan Zhongmei E-commerce Company E-commerce Practice Training Class Opening Ceremony was held in Shandong Coal Group e-commerce industry park, more than a dozen electric business professional interns from Yantai Nanshan College in the professional led by the teacher to visit China Transport Group for training and learning, Deputy General Manager of China Transport Group Li Zhenbo, General Manager of E-commerce Company of China Transport Group Yanting,Vice President of E-commerce Company Yu Cui, Zhang Zhenuo, Lu Shuli and other leadership accompanied the visiting and attended the opening ceremony. Under the leading of Deputy General Managerr Li, the visiting panled visited the new office building of China Transport Group and E-Commerce Companies, Cross-Border E-Commerce Company, Network Information Company, Software Technology Company, Weixin Agricultural Technology Company, Kate Intelligent Robot Company, Intelligent Terminal Equipment Exhibition Hall, watched live demonstration of high-tech unmanned aerial vehicles and intelligent robot which independent research and development by Shandong Kate Intelligent Robot Co., Ltd, branch of China Transport Group. 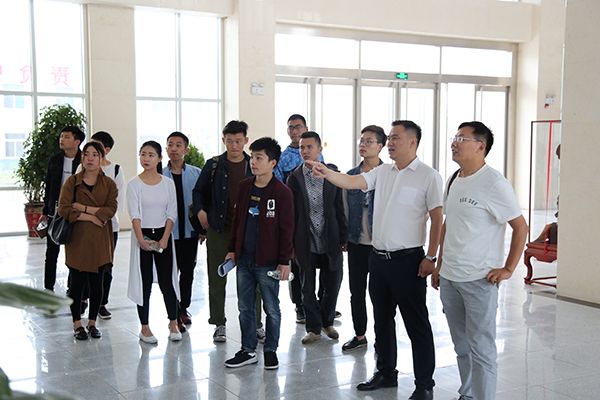 During the visit, Deputy General Manager Li made detailed introduction of total development of China Transport Group in e-commerce, cross-border e-commerce, new industry, e-commerce personnel training and other fields to the students and teachers, and received praise! by the students and teachers. Subsequently, in the Group conference room on the second floor, e-commerce practice training class opening ceremony of Shandong Nanshan Zhongmei E-commerce Company was held. At the ceremony, Deputy General Manage Li firstly expressed warmly welcome to the students and teacherson behalf of China Transport Group, Deputy General Manage Li said, Shandong Nanshan Zhongmei E-Commerce Co., Ltd. is jointly invested by the China Transport Group and Yantai Nanshan Group, the two sides adhere to the principle of mutual benefit, resources sharing to achieve the powerful combination of Nanshan Group's industry, product advantages and China Transport Group's power resources, to create an internationally renowned brand of e-commerce! China Transport Group, as the largest and most powerful industrial enterprise in Shandong Province, is experienced in the training of enterprise e-commerce personnel. According to the development plan and arrangement of Shandong Nanshan Zhongmei E-Commerce Co., Ltd., Our Group has sent promotion team elites that led by the Deputy General Manager Fan Peigong for three times to Shandong Nanshan Zhongmei E-commerce Company, to carry out team and skills training for the recruited staffs, and achieved good training results, hope to use, mastery, consolidate knowledge and practical operation during practice training at Our Group, and communicate with our e-commerce elites, as soon as possible to get familiar with the specific business process of e-commerce, prepare for working at Shandong Nanshan Zhongmei E-commerce Company in the future. It is known that the Yantai Nanshan College teachers and students will be accept a two-week e-commerce training at Shandong Coal Group, during which professional e-commerce elites will personally guide the new students on the machine operation, Group business embedded in daily teaching for new students, so to make everyone get contact with the actual business, to break the status of college students getting acknowledges from books without practicing so that every new student can enhance practical ability at the same time, also better adapt to environment and culture of e-commerce company! Shandong Nanshan Zhongmei E-Commerce Co. is jointly set up by Yantai Nanshan Group and Shandong Zhongmei Group. Yantai Nanshan Group, as the top 500 enterprise in China, has a strong industrial base, China Transport Group as the MIIT E-Commerce Innovation Enterprise, Shandong E-Commerce leading enterprise, has rich experience in the e-commerce platform construction and operation. The two sides will work together through the Shandong Nanshan Zhongmei E-commerce Co., Ltd., to build a global diversified, comprehensive product sales e-commerce service platform, to play a mutually beneficial role in their respective areas, through complementary advantages, resource sharing, strong combination, to better achieve the win-win situation for both enterprises, make a positive contribution for the rapid development of e-commerce !